The Gashimov Memorial saw five draws on the first day. | Image: Shamkir Chess. 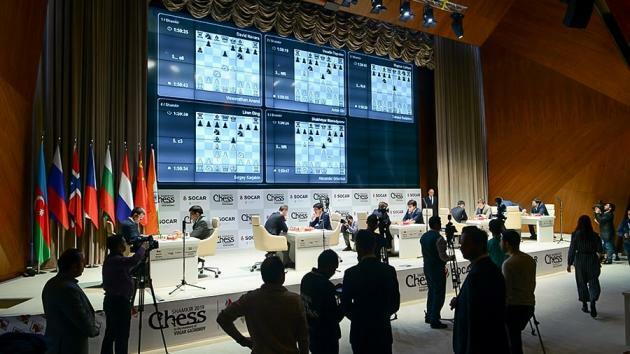 The Gashimov Memorial started on Sunday in Shamkir, Azerbaijan with all games ending in draws. Viswanathan Anand seemed on his way to win until he missed a brilliant defense from David Navara. We shouldn't get ahead of ourselves, but it seems inevitable these days that tournaments full of top players are also tournaments full of draws. It's important to emphasize that there's nothing wrong in itself with fighting draws, and the no-draw-offer-before-move-41 rule in Shamkir might help with that. Four of the five games in the first round were very interesting. The tournament started with a minute of silence in memory of the March Days, a period of inter-ethnic strife and massacres of about 12,000 Azerbaijanis and other Muslims between March 30 and April 2, 1918. | Photo: Shamkir Chess. If anyone really should have won, it's Vishy Anand. David Navara admitted he got "outplayed" in the opening and he was losing for several moves until Anand suddenly missed a beautiful idea, shortly after the first time control. Anand had Navara on the ropes but missed a study-like defense.| Photo: Shamkir Chess. It had started with the rare move 6.Bd3 against the Najdorf, when the game transposed into a Dragon after 6...g6 7.f3. Normally the light-squared bishop goes to c4 or stays on f1 while Black usually doesn't want to waste an early tempo with ...a6, so the question was who would benefit from these differences. Navara spent a lot of time in the opening to figure this out, and his 13...h6 was clearly intended not to end up in a worse version of known lines. He kept his king in the center while sacrificing a pawn on h6. Anand showed the flaws of this setup, but then played slightly inaccurately which kept Navara in the game. The Czech GM was clearly making the most of his chances, but White should still be winning after move 40, except that Anand completely overlooked something very nice. Navara on his rook move: "Honestly, this move was not on my radar until Anand came up with 41.Qe7. Once it happened I executed the idea without any delay." | Photo: Shamkir Chess. Magnus Carlsen couldn't be too unhappy with a draw in the first round. Not only did he start as Black vs Teimour Radjabov, but he was actually in some trouble as well. The world champion started off modestly by countering his opponent's 3.Bc4, intending a Giuoco Pianissimo, with a Hungarian Defense-like setup with the bishop on e7 instead of c5. He followed-up with the pawn break ...f5, but his second pawn break was a bit too much. Aggressive opening play by Carlsen vs Radjabov. | Photo: Shamkir Chess. The 15...d5 move was "overpushing" it, according to Radjabov. "Too ambitious," said Carlsen. After that, Radjabov initially played strongly and was clearly better, but then he chose the wrong plan and the game petered out to a draw. Asked about marriage (!) at the press conference, Carlsen replied: "Right now I am married to the game." | Photo: Shamkir Chess. The game that had the wildest opening position was the one that ended in a draw the quickest. Sergey Karjakin and Ding Liren took less than an hour to split the point, avoiding the anti-draw rule by repeating moves. The players followed Ding's win with the black pieces against Jorden van Foreest, last January in Wijk aan Zee. In this sharp Giuoco Piano, where Black pushes his g- and h-pawns in front of his castled king, it was Ding himself who deviated first. Karjakin quickly agreed to a draw with Ding. | Photo: Shamkir Chess. Karjakin had also prepared a bit for this other move, but nonetheless couldn't prove an advantage against it. Anish Giri trying to make sense of Ding's preparation. | Photo: Shamkir Chess. Anish Giri was doing well against Veselin Topalov, who played his first classical game since August last year. Although the Bulgarian GM isn't that interested in chess anymore, he didn't show signs of rustiness in this first round. Giri was in control of the position until move 40 when he suddenly misjudged the position and allowed strong counterplay. "The h-file is huge for him, and I was lucky to hold," said Giri. A brief, nervous moment for Giri at the end of the game. | Photo: Shamkir Chess. The game between Alexander Grischuk and Shakhriyar Mamedyarov can hardly be commented upon. This well-known drawing line in the 5.Re1 Berlin mostly showed that both players were perfectly happy with a quick draw to start off their tournament. Alexander Grischuk entered the tournament already tired. | Photo: Shamkir Chess. The Gashimov Memorial has a prize fund of 100,000 euros ($112,266) with a first prize of 30,000 euros ($33,678). The venue is the Heydar Aliyev Centre in Shamkir, Azerbaijan. The playing days are March 31-April 9 with a rest day on April 5. The games start at 3 p.m. local time (last round 2 p.m.), which is 1 p.m. Central Europe, noon London, 7 a.m. New York, and 4 a.m. Pacific. The time control is two hours for the first 40 moves, then one hour for the next 20 moves and then 15 minutes to finish the game with a 30-second increment from move 61 onwards. No draw agreements by the players are allowed before move 41. The official website is ShamkirChess.com. You can watch the games live at Chess.com/events.